This edited article about Thomas Holloway originally appeared in Look and Learn issue number 354 published on 26 October 1968. When Queen Victoria came to the throne in 1837, the practice of medicine was not in a very advanced state. Some doctors, through ignorance or carelessness, killed as many people as they cured. Besides, working people often couldn’t afford doctors (there was no free medical service then). Instead, they bought simple remedies from “quack”* doctors and patent medicine pedlars. Many of these remedies, based upon old and proved formulas inherited from herbalists, did little harm and often some good. Some “cures” did no good, but no harm either. Others were positively dangerous to health. The pills and ointments made by Thomas Holloway were known throughout Britain and many countries beyond. 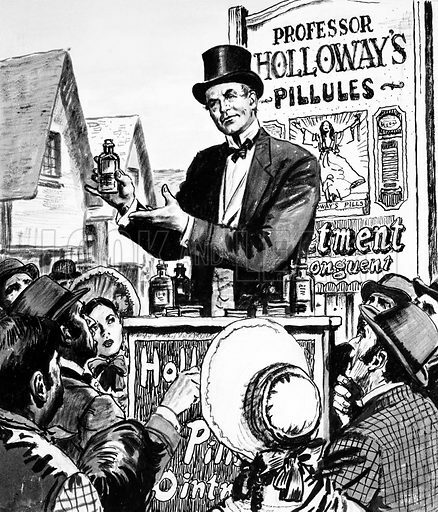 “Holloway’s Pills” were advertised in newspapers and magazines and from huge hoardings, for Holloway was a great showman, an enterprising and perhaps rather artful man. He once put up a hoarding advertising his pills on Egypt’s Great Pyramid! By such bold and unorthodox advertising methods, Holloway made a vast fortune. The things he said about his pills and potions would never be allowed today, but in those days an advertiser could make almost any claim he liked for his products. Thomas Holloway was born on 22nd September, 1800, at Devonport, near Plymouth. He had virtually no education and at the age of 28 was living in Cornwall, at Penzance, helping his mother and brother in the baker’s shop which his father, a soldier in a militia regiment, had left them when he died. Then Thomas left Cornwall to seek his fortune in London – and found it in an unexpected and spectacular way. Regular work was hard to get, and he became friendly with Felix Albinolo, an Italian leech-seller from Turin. At that time doctors “bled” patients for almost any complaint and often used leeches for the purpose. Felix is a Latin word meaning “happy”, but Felix Albinolo was to prove far from happy. He began making and peddling an ointment with the high-sounding title of “Albinolo’s or the St. Come and St. Damien Ointment”, got into debt, and was flung into prison. Holloway, who had learned the business from Albinolo, then started making his own medicines, giving them impressive names such as “Pillules Holloway” and “Onguent Holloway”. He called himself “Professor” and wrote pamphlets to accompany his remedies, suggesting that they could cure almost everything. These pamphlets were almost works of genius in the way they bamboozled the public. Hygieia, the Greek goddess of health, was shown in her flowing robes on a step engraved with the words “Holloway’s Pills” and, to impress the buyer still further, Professor Holloway offered to supply directions in 20 different languages, including Arabic, Chinese and Gozzerattee! In his richly-appointed house in the Strand, in London, Holloway and his wife laboured day and night making pills and ointments. Sometimes the Professor would sally forth to call at houses or make a tour of the docks, where he sold his remedies to dockers and seamen. He really believed that his products were good, and they may in fact have been indirectly beneficial in that the people who bought them expected them to be so, and accordingly felt happier in their minds. Happiness or optimism helps towards recovery in many illnesses. Holloway was one of the first Victorians to realize the power of advertising. He spent almost all his income in this way, so that the demand for his goods would grow rapidly; sometimes, unfortunately, he booked expensive advertising before he had been paid for his supplies. Once he spent £100 in a week, and sold only two boxes of pills. As a result of his passion for publicity, he became bankrupt and went to prison for debt, but he later made an amazing recovery, paying all his debts and a ten per cent bonus to those who had trusted him. To the newspaper that had tried to ruin him by refusing to wait for the money he owed them, he paid nothing. When the Law Courts were built in the Strand, Holloway and his wife moved to a house in New Oxford Street. His advertising now assumed fantastic proportions. Within four years he was spending £5,000 a year, rising to £20,000 a year by 1850 and to £30,000 a year five years later. His rivals first sneered, then envied him. Mountains of Holloway’s pills were swallowed, and barrels of ointment used by his trusting customers, making him one of the richest men in the land, with an income of over £50,000 a year. The purchasing power of such an income today would be about £250,000, since the pound was worth vastly more then. By nature, Holloway was a kindly man. He was impressed by the statement, made by the philanthropist Andrew Carnegie, that it was a disgrace for a rich man to die rich; he admired the charitable works of the great reformer, Lord Shaftesbury, and especially the generosity of George Peabody, the American who did so much to improve the housing conditions of the London poor. Having no children of his own, Holloway wondered how he could use his vast fortune for the public good, and followed Lord Shaftesbury’s suggestion that he should build a home for the mentally afflicted. In those days, mental illness was regarded as a disgrace. People did not understand that it could be just as disabling and distressing as any other ailment, and just as difficult to avoid. Those who were actually permanently insane, and those who had merely given way under some strain or other and were just temporarily unwell mentally were treated alike: they were put into straight-jackets or kept in solitary confinement. They were often beaten. Frequently their condition got worse, when, with competent and sympathetic treatment, they could have been cured. Entirely at his own expense, Holloway built the magnificent Holloway Sanatorium at Virginia Water, a 500-room building set in 20 acres of peaceful gardens bright with flowers. He studied mental illness and its treatment by visiting institutions on the Continent and in the United States, nothing bad features to avoid and good ones to adopt. It was a progressive and humane idea for the times, to take in middle-class patients and treat them, not as lunatics, but kindly and sensibly, in happy and beautiful surroundings, with the object of curing and restoring them to normal life. The standard Holloway set was far in advance of anything then existing, and the scheme cost him ¬£350,000. He really was a pioneer in this field and the world owes him a debt of gratitude for pointing the way to a more humane approach to mental illness. Next, under the influence of his wife, he made ambitious plans for a “Ladies’ College”, a quite new idea then, for the education of women was not regarded as a necessity. He gathered round himself able advisers, travelled abroad to study similar institutions, and built the Holloway College for Women at Egham. Holloway took great trouble to make the school both beautiful and unlike any other school in existence. The building was an exact copy of a famous sixteenth-century French chateau at Chambord, and to ensure this, his men measured the original building from top to bottom in every detail. Together with the land, furnishings and fittings, the college cost him the then staggering sum of £600,000. It was, perhaps, an odd sort of building for a college. But it had dignity and interest, was finely constructed, and made a magnificent centre for female education. Holloway spent £85,000 on an art gallery and stocked it with fine examples of the work of Victorian artists such as Millais and Landseer. The college, opened by Queen Victoria in 1886, is today part of London University. Thomas Holloway was an eccentric but likable philanthropist whose ideas and generosity did much real good. One of his eccentricities was that he disliked doctors and, when he was ill with congestion of the lungs, refused orthodox treatment. His own medicines could not save him, and he died at Sunninghill on Boxing Day, 1883. * So called from the noise they made to attract customers at fairs, etc.